This challenge is best done in a group of at least four children. You'll need to print out this sheet or, if you would like much larger cards, these sheets. The sheets will need to be cut into twelve separate cards. Share all the cards out amongst the group. 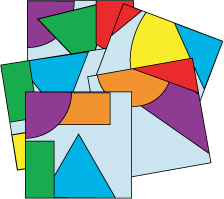 Can you each work out what shape or shapes you have part of on your card? Can you describe the shapes without showing it to anyone else? What will the rest of the shape or shapes look like do you think? How could you sort the cards? Practical Activity. Tangram. Squares. Triangles. Selecting and using information. 2D shapes and their properties. Visualising. Interactivities. PrimaryCollaborative. Compound transformations.